Downstream on our tea-colored Withlacoochee River to the Blue Spring, it’s the October WWALS Outing! Where: Sullivan Launch to Madison Blue Springs State Park. Distance: 10.2 miles, about 5 hours, after a shuttle of about 40 minutes. This outing is Free! But we encourage you to join WWALS today to support our fun outings and important work: http://wwals.com/blog/donations/. See our newsletters, and the press Releases and news. And consider joining the new Withlacoochee and Little River Water Trail Committee. 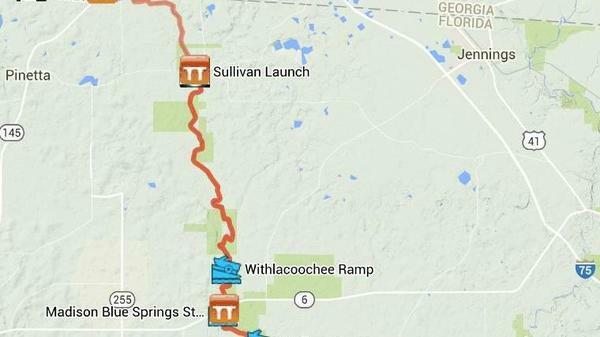 Directions: From Pinetta, Madison County, FL, travel east on CR 150; turn right at the bridge and follow road to launch. Also known as CR 150 Bridge Launch. It’s in Twin Rivers State Park. Need: River level 5.75′ or higher at Pinetta gauge. Note the Florida USGS gages have changed from their former readings above NGVD (approximately sea level) to readings above dry level on the river at the gage site. The Pinetta gage is 47.21 ft above NGVD of 1929, so the old minimum low level of 53′ is now 53′ – 42.21′ = 5.79′, rounded to 5.75′. Allen Landing on the Withlacoochee River to Suwannee River State Park on the Suwannee River, about 8 miles or about four hours. Directions: From Jasper, FL travel north on US 41 to SR 6; turn left; travel south on SW CR 141 to SW CR 143; turn right and follow SW CR 143 to SW 64 Way and follow to ramp. And coming up even sooner, Saturday October 3rd, it’s Kayaktivism Day on the Withlacoochee River at Langdale Park in Valdosta! This entry was posted in Blueway, Outing and tagged Allen Landing, Blueway, Chris Mericle, conservation, Georgia, John S. Quarterman, Lowndes County, north Florida, Outing, river, south Georgia, Suwanne River, watershed, Withlacoochee River, Withlacoochee River Water Trail, WWALS, WWALS Watershed Coalition on July 15, 2015 by jsq.